Trees and shrubs need to be properly pruned on a regular basis. Pruning provides many benefits: enhanced beauty, increased health and vitality, hazard reduction, and controlled growth. But in order to achieve any of these benefits the pruning must be done properly. To understand this, take the crape myrtle, a popular species in North Carolina that is often pruned improperly. Typically the tree is planted at a young age when it is small and fits neatly in the available planting space. Years pass by. One day someone looks outside and realizes the crape myrtle is overgrown, unruly, and much too large for its current location. A tree service arrives on site and hacks the tree down to an arbitrary height of the client’s choosing, typically 8 to 12 feet above ground. We call this crape murder. What is wrong with this scenario? The pruning did not provide any of the benefits above. Enhanced beauty? No, quite the opposite. Now it looks like a vertical pile of sticks with no natural form and beauty. Increased health and vitality? Not at all. This pruning places the tree under tremendous stress, making it more susceptible to attack from insects and disease. It can also lead to decay, which will kill select trunks or the entire tree. Hazard reduction? Possibly in the short term, but not in the long term. If the tree survives, it will produce many new shoots that all have weak attachments to the trunk, which means they split off easily. Controlled growth? Not even slightly. If the trunk survives, it will produce lots of new bushy growth where the cuts were made. The crape myrtle will actually require more maintenance than it did before. The perfect analogy is the Hydra from Greek mythology; when one head was cut off, two more appeared. What should have been done to obtain benefits from pruning and avoid crape murder? The solution starts early in the tree’s life. Before planting, choose the right species for the right location. Find a crape myrtle cultivar that will fit within your desired planting location once it is mature. There are many options to choose from, including dwarf varieties. Choose the right crape myrtle for the right location and you will never have to consider something so dramatic as crape murder. 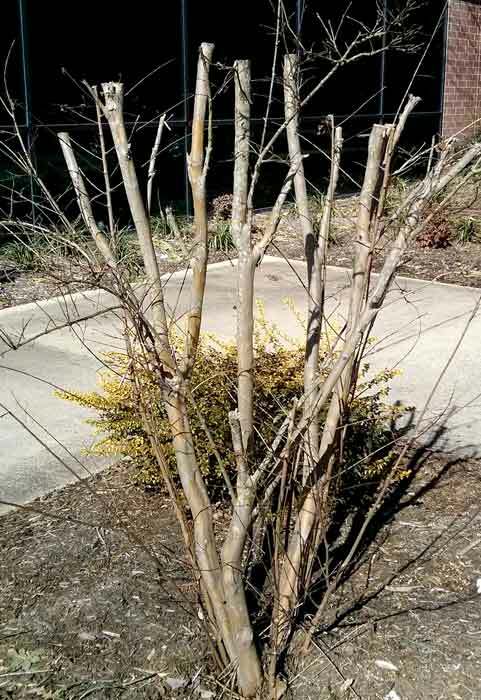 Begin pruning the crape myrtle at a very young age. By doing so, you can train its growth over time to enhance beauty and meet your preferences. As the tree ages, prune it regularly using proper techniques. Make clean cuts at the branch collar with sharp tools. Thin out the canopy. Remove dead, crossing, damaged, and conflicting branches. These techniques reduce bulk, increase the health of the tree, and help make it look delightful. If you are trying to reduce the height or spread of the crape myrtle, you can reduce size somewhat by using selective heading cuts and possibly pollarding. But these will only provide limited size reduction. Moreover, both are time-intensive pruning techniques that require expertise. What can be done with the large, mature crape myrtle that needs dramatic size reduction? Unfortunately, short of time travel, there are no good options. Crape murder is certainly an option, but that yields an unsightly, unhealthy tree that requires heavy maintenance every year. Another option is to remove the tree and simply start all over. Hopefully your crape myrtle is simply in need of a little tender loving care. Prune it using proper techniques, make sure it has healthy soil with plenty of nutrients, and keep the root collar dry. Yours is sure to be a healthy crape myrtle exuding natural beauty.